The hockey team’s first outing on the ice this season was a 2-1 exhibition over the Soo Thunderbirds. The Lawrence University men’s ice hockey season is officially underway. This last Saturday, the men suited up to participate in a scrimmage against a junior A team out of Northern Ontario. The guys were excited to put all of their hard work to good use against a real opponent. The Soo Thunderbirds hail from Sault Ste. Maries, Ontario, Canada. Having been through many years of success, they are considered a higher-level junior team, fit for our Vikings first competition. Many people on campus do not understand what juniors is. When asked about it, a sophomore said, “All I know is that the guys come in as freshmen when they’re, like, already 21.” The players try and explain this to their peers when they get the chance, but the hockey system is different and can be a little confusing for some. To clear up why the first-year hockey players start school later than the traditional first year, more detail about what juniors is will be necessary. Junior ice hockey is a level for players generally between ages 16 and 21. In the United States, the junior level is broken up in tiers. Tier I is the United States Hockey League (USHL) and is mostly based in the Midwest. Tier II is the North American Hockey League and spreads across the west. About 10 percent of these players are seen to move on into NHL careers. In Canada, junior hockey is broken into different levels of Major Juniors. Junior A has three leagues overseen by the Canadian Hockey League: Quebec Major Junior Hockey League, Ontario Hockey League and Western Hockey League. These leagues operate within Canada and the United States. The teams within these leagues are considered professional-level teams, as the player are paid. Thus, any player who participates in this league is not eligible for collegiate play in the US but can play for Canadian Universities. Forty percent of NHL players come from this level. Junior B, C and D also exist and are considered to consecutively be the step behind Junior A level. These levels are not governed at a national level and the players do not receive payment for their participation. Participating in juniors hockey until you reach the age limit of 21 is vital to achieve highest potential before moving on to collegiate or professional play. This is why our first-year hockey players are coming in a few years older than the traditional students. They take those extra years to fine-tune their abilities and aptly prepare for a higher level of competition. The Soo Thunderbirds are a Junior A team, putting them at the highest level of competition that juniors can be participating in. This makes them the perfect opponents to test our abilities against before heading into regular season. Lawrence trailed the Thunderbirds 1-0 until junior Daniel Gysi found the back of the net in the second period thanks to assists by first years Brandon Halvorsen and Taylor Urch. 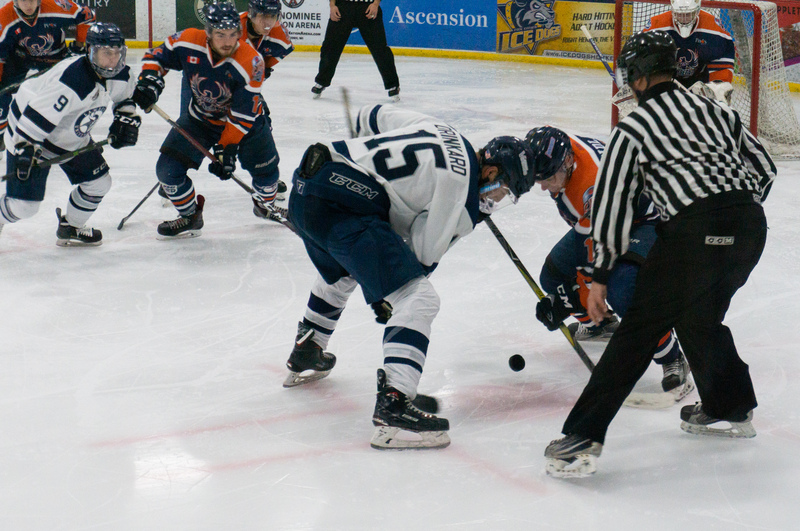 The game remained tied for the rest of regulation time, three full 20-minute periods. The Vikings had 28 shots on goal in the third period alone, giving the Thunderbird’s goalie 58 stops throughout regulation time. With 42 seconds left in overtime hockey, senior captain Josh Koepplinger scored the game winning goal with assists from first years Charles Stewart and Halvorsen. The Vikings left the rink with a 2-1 overtime victory over the junior A team from Ontario. The Vikings open their regular season next weekend, November 2 at Adrian College, who was ranked No. six by the NCHA coaching poll. Their first home game will be Friday, November 9, at 7:00 p.m. against the Aurora Spartans. In the words of Head Coach Mike Szkodzinksi, “There is never a bad time to cheer for the Vikings. Be loud and help us continue to have one of the best atmospheres in the NCHA.” Good luck to the hockey guys and go Vikes!